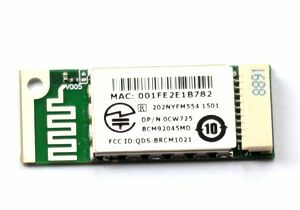 This Wireless 355 Bluetooth Card is based on the Bluetooth 2.0 standard with EDR (Enhanced Data Rate) technology. EDR technology boosts bandwidth while reducing power consumption and maintaining backward compatibility with older Bluetooth devices. It offers data transfer rates of up to 3 Mbps so you can transfer files with ease. Do they have a driver for this hardware that is compatible with Win7? Because so far I’ve not been able to use my bluetooth since upgrading to Windows 7. It’s not even discoverable and not listed on the hardware list in the device manager. I’m using a Dell Inspiron 1525.
i recently upgraded to windows 7 but my blue tooth 355 module is not working any one has the information on the driver for windows 7!!! hi, anybody knows ehere i can download wireless card driver for my dell vostro 1500 ?? dell website drivers doesnt work with it.??????? Gracias por el driver de bluetooth, funciona muy bien. i’ve downloaded from site but there is some fault in that driver. R140135 are also working for windows 7.
am using the dell inspiron n14 4010 model laptop in this laptop wireless drivers are not working properly. In this laptop i had installed windows 7 64 bit OEM any budy give me the solution for this problem. and i need Bluetooth drivers also.